Harper and I have had a kind of out of sorts day. I can't put my finger on it but I've been kind of blue and she has been kind of grumpy. And don't get me started on the fact that I took a grumpy, fussy baby to Wal-Mart and after they had scanned all my items the computer broke and I had to stand there for 20 minutes while they tried to figure it out and ended up moving me to a different line to rescan all my items. AWWWWW....Patience is a Virtue. Anyway - I put Harper in these new pajamas tonight that my Aunt Linda bought her and they were so cute I had to take her picture and I even had to try putting a little bow in her hair (gasp - not a HUGE bow - just a little one!) She was so precious and I was just thinking about all the things about motherhood that have been easier than I thought and all the things that have been harder and I thought I would make a little list. Adjusting to being at home - I was worried I might get bored. ha ha ha ha ha ha - oh that makes me laugh. Protecting her from germs - I was never a germ-a-phobe until she was born and now I think about it constantly - it will only get worse this winter. Leaving her .....EVER. I thought I would be back to normal right away .....going to choir, doing this and that.........but I hate leaving her. Ever looking half way decent - I am always covered in spit up, drool, squash and I'm sweaty and a hot mess. But what's easier than I imagined - I really don't care about that! Making play dates. I figured I would hang out with Laurie all the time or other friends but most of the time - I just enjoy being at home with her by myself. This isn't hard - just different than I imagined. Not being able to serve like I have before. Serving is my spiritual gift and having a baby - I just can't serve as much as before and that has been strangely hard for me but it's okay. I tell myself every day that right now Harper is my mission field and I will serve her for this season in my life. Dressing Harper up cute and getting her to stay that way for more than 5 minutes before she starts spitting up or drooling on her outfit or tugging her bow off. I've learned to take her picture the minute I get her dressed or the cuteness is over. ha! Keeping a clean house and putting dinner on the table every night. I thought our house would just sparkle because I would clean all the time. Either I don't have the time or I'm too tired. What about you? What has been different about motherhood than you expected? Easier or Harder? Oh, Kelly. You serve through this blog. I'm not a mom but I'm newly married and you give me so many great recipe and home ideas. You give mom's inspiration and create a community where people know that you're all in this together. I know having such a large following can't be easy - I don't know how you do it!! But I can see that's had such a positive effect on people. God bless. I second all of that! My little boy is exactly one month younger than Harper and its amazing how much they show u that u really don't know what to expect until they get here. The easiest thing about "Grandmotherhood" is loving on that sweet baby ever chance I get!! The hardest thing about "Grandmotherhood" is not getting the chance often enough!!! I would love to give her some sugar in her sweet little monkey pj's!!!! LOVE, LOVE, LOVE those pictures!!!! That has got to be the cutest bedtime pictures ever! Sorry you are having the blues today. It must be the weather. Sending you smiles and a BIG hug! I love the bow and the cute pictures of Harper! Easier was getting him to sleep! I was all prepared for no sleep, but Miles is a sleep champ. Parenthood is the most amazing, challenging, and rewarding thing ever to happen to me - I'm enjoying every minute. I love your blog - you keep motherhood "real"! True, you are still serving. your blog is wonderful and you have been serving God through all your words. Ok so it is all easier with the second. I can't believe I ever thought anything was hard with the first. Ha. The second time around you are so clam and relaxed. It is wonderful. umm, I agree wtih most of your lists except I would move childbirth and breastfeeding to the hard list! Isla has the same pj's for next winter - they are adorable! Easier than I thought: knowing what to do with a baby. I had never so much as changed a diaper until my first child was born! Harder than I thought: the sheer repitition of the day to day tasks involved in taking care of children. Kelly, I know you are going to El Salvador this fall. When it gets closer to time, I'm going to try to figure out if you'll be visiting the center my sponsored child, Patricia, attends: CONFAD - ES778. awesome post. You're such a good mom! I like the new jammies!! Kelly, my boys are 9 and 11 and my husband and i JUST began serving again! They were my focus and God gave us these boys to raise up and care for and i couldn't do that properly and serve in other ways! We are getting back to it and it is easier now that they are older. We are beginning slowly and seeing how much we/they can handle! Keeping a clean house... now that doesn't get any easier! Sorry! Are you kidding??? You serve people thru this blog!!! I think you reach out to other mothers, both new and not new, those wanting to be mothers and wives! You do an awesome job of it! I come here and I truly feel like you are my real friend. We have some of the same troubles and concerns. You are serving the Lord, it is just in a different way, a new way! As for the hard and easy parts: giving birth and breastfeeding and loving my 2nd baby as much as my first have been the easy parts. I was scared that the 2nd baby wouldn't be as loved by me b/c I felt that pregnancy the 1st time was just me and the baby and my husband and then the 2nd pregnancy I was busy taking care of my 2 year old. The hardest parts are making sure my 4 year old knows she is equally as importnat as my 2 year old, making sure I never show favoritisms, losing the baby weight that I have held onto for 2 years!!! And I hate to leave my girls. I love it too when we are home and it is just us. I am selfish with them b/c I know in a flash they'll be another year older. And you had posted something the other day about loving Harper so much. I feel that too with my girls. I love them so much sometimes I truly feel my heart ache. My mom has always told me she loved me like no one else ever would and I see it now. I get it. I know my girls are loved by so many people but the way I love them is so strong. It is the strongest thing I have ever known, our bond is amazing. I am a daddy's girl all the way and I always tell my husband the relationship he will have with our girls will be what he makes it. I hope they can have what I have with my daddy! I think sometimes my husband may feel left out!!! I think the hardest thing for me is not having all the friends I had before I had Parker. Sometimes I feel left out because we have a baby. This is very encouraging for the kids I hope to have one day!! Your blog is a huge service to everyone who reads!!! Hope you have a great weekend...Harper is precious as always and I hope you feel better! Oh how I loved reading this post! -Making time for us to go out...like you said, I love being at home with my baby! -Keeping dishes out of my sink and folded laundry! -Losing baby weight...lost 35 lbs, but have a bunch more to go! Taking care of my baby is so much fun! Just hanging out with my baby...love to go places! Honestly, I sometimes miss being able to just run out to steak and shake with my hubby (pre-baby) but I wouldn't change anything. Babies are such a gift from God and we only get them for such a short time! I for sure think the hardest part is the intense feeling of the worrying about my kids. No one could have ever explained or prepared me for how it would feel to worry about my own child...especially when he was only 12 hrs old and started having seizures. Then, when it happened again at 4.5 yrs old, I knew I had to get control of the worry. But its always there and its for sure, the hardest part for me! I agree wtih most of what you said was easy and hard. I think one of the hardest things is just the neverending demands of being a mom. You always have to be "on". You can't call in sick, it doesn't matter if you need to go to the bathroom, have a headache, need a break, etc. They always come first. I wouldn't have it any other way but some days it's just exhausting. Breastfeeding and the lack of sleep for me were WAY harder then I imagined. 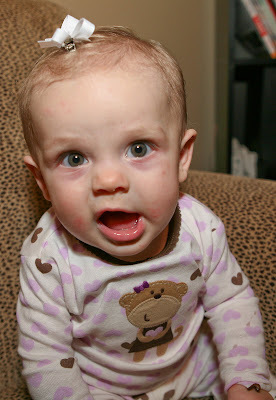 But my daughter did have colic and didn't sleep through the night until nine months. And I ended up having to pump all of my milk breastfeeding was so hard but I did it and I'm glad I did(: Childbirth was easier then I expected. I know what you mean about serving...We used to have people over for dinner all the time and I would host parties and showers too. I am so worn out after working all day..I can't even cook for us! I don't want to do anything but hold my baby on the couch! I am a "career woman" and thought that's what I wanted but it's way harder than I expected to leave my son every day for work. I would love to work part-time but that's not really possible in my field right now. Sometimes - managing different family members and "advice," etc.!! I love your blog, Kelly. The pictures of Harper are so precious! For me, childbirth was a breeze! In fact, when my daughter was born, I said, "That's it?" It was way easier than I had ever thought. The part that was hard for me was breastfeeding. It hurt so bad in the beginning and I was a stressed out mess because I was worried that my baby wasn't getting enough to eat. Every time she would start to get hungry, my body would tense up knowing how bad it was going to hurt. But we stuck it out and finally got the hang of it. I had great support from my husband and friends who were also new moms. I nursed her for a full year! Loved this post....you are so "real" and I love that about you! Harper is definitely "Daddy's Girl" in these pictures...more so than in others! I know you don't want to leave Harper, but occasionally, a little "me" time is soo good for the soul. Think about trying to find someone, possibly from your church, to keep her just a few hours in the afternoon during nap time, and you can just get out for a little while. It will do wonders for you and will also be good for Harper, even if it's just once every two weeks at first. If you have a college closeby, possibly a student majoring in child development, would be an avenue to pursue. My daughter and her sorority sisters do this, and they all LOVE the children that they play with. Harper is as cute as ever!! Oh how I love you so!!!! I can just say check, check, check on each list like I wrote them myself. I REALLY identify with protecting from germs (like I think I need to be medicated kind of germ-o-phobe now :)). But, in a way you have to and you know that. I know that because I SEE things in the OR working at a Children's hospital. I also identify with being a social person, loving to be on the go, but prefer now to just enjoy my babies at home now without having umpteen things planned all the time. Thanks for the great post today! We adopted this time around and so many things have been harder. Leaving him was way harder this time. He's been home 8 months and we've just started leaving him in church. After we got home, he contracted Rotavirus and now I'm a germ a phobe. I wash down my cart at walmart, etc. I think that just having a baby in the house in general was hard for me too b/c Naia was almost 5 years old before Paxton came home. I've had to learn that he is NOT independent like they were! It's a constant struggle that I have, not wanting to have to wait on him and and foot, b/c I wasn't use to that anymore! It's definitely been an adjustment in our house, but we're getting there and I wouldn't change it for the world. Love the pajamas! Ella has them too. She loves them. Can Harper get any prettier?! She is so beautiful! Overall, Wells is pretty happy go lucky. I'm worried that #2 will not be this way & I'll have to be a schedule mama. Breastfeeding. Basic baby care. Going back to work. Sleep deprivation. Once again - not ready to do it over with #2 yet. Energy/desire to clean the house. Feeling left out of the crowd - like Wells won't have little friends at church. Which is ridiculous, I know. I have blue days too. Call me, neighbor, & I'll do my best to entertain you with HDN imitations! Hi Kelly. I love reading your blog and keeping up with Little Miss Harper. I have B/G twins that are 8 months old and you can probably guess the question that I get all of the time...How on earth do you do it? Well, to be quite honest, I don't really know; I just do it. I think things might be a little different had I had another child before them, but the twins are my first, so I didn't know any different. *motherhood in general has been so much easier than I EVER expected! My babies are true miracles and I thank God for them each and every day. If you get a minute, head on over to my blog...I want to show off B&B to you! I just love them to death! Girl, you make it sound so easy. Hopefully I have good luck, like you! Child birth wasn't so bad, but the blues were. I experienced the "blues" after the birth of each of my 3 boys. I think that was the hardest for me. Oh, how I loved feeding them!!! I still love to watch my 15mth old eat. So sweet!! I don't think the hard part of having kids is the physical act of taking care of them. The hard part is finding the balance. No matter how hard it is, it is worth it!! i think that worry in general has been the hardest thing for me. i worry about germs/sickness all the way to if i'm pleasing God with how i am mothering, to whether or not they will make good choices when they start school...and on and on and on. it's just hard! i think patience has come easier, though. i do lose my temper some (like everyone) but for the most part i was surprised how that came much easier than i expected. Glad to see child birth was considered a breeze for so many! haha! But, Kelly, I almost fell out when I read the first post about someone asking for a recipe for sweet tea. Oh mylanta! Breastfeeding was MUCH harder than I anticipated. I almost gave up so many times. I finally did give up though at 7 months. I was tired of pumping in our work bathroom :\ and Owen started refusing to nurse. It was such an emotional experience and something I think would have gone much easier if I could have been a SAHM. You are SO lucky to be able to stay at home! Imagine trying to do all of that with a 40 hour work week as well! Labor was worse than I thought it would be, but I went the natural route and didn't get the epidural for 38 hours. Finally I came to my senses and had him 2 hours later. So the delivery was SO much easier than I thought it would be. The whole adjustment was very hard for me as a whole. I felt like I couldn't do anything or go anywhere because of I had a baby and it would be too hard. I wish I would have just gone out more after having him. I had some PPD because I didn't. I'm glad everything's been so easy for you though! You are a blessed girl! ok this is a question from a mama of two little boys (and hoping God chooses to bless us with a little girl at some point) how do those adorable tiny bows stay on a babes head without much hair? I very rarely comment because I feel like by the time I do, people have already said what I wanted to say. But, today I feel the need to delurk and say something. I have a three month old baby boy and I'm finding that the hardest part about having a baby is just feeling adequate enough. I never feel like I can give enough to him on a daily basis. I will never regret my decision to stay in the workplace because I do not think I would be a good stay at home mom. But, I feel like I am so rushed in everything I do! I want to spend as much quality time with him as possible when I am home, but the laundry needs to get done too! That was something I wasn't expecting. Potty training was HARD! I taught preschool for years and potty trained many but when it's your own, whew! Not laughing when they do something naughty that is also funny is hard. Many time I have had to leave the room after putting him in time out to laugh. Going to the store is not too bad....when we had the two extra kids last summer, it was difficult. Getting up earlier than him so I can get ready for work is hard. Seeing him get hurt and not being able to stop it is hard. Never have been concerned about germs.....I am concerned when he eats something off a picnic table or floor before I can get to him, gross!!!!! Finding time to talk with other moms is hard....when we are talking the kids get itno something. Hardest thing abt being a Mom for me is knowing when to let them fail and not saving them every time. Mine are 18-20-22 and yoou never stop worrying! Just look at those gorgeous green eyes! She's a sweetie Kelly. 2.trusting that God will protect my children-I know He is a loving, good God but I hear about things happening to kids all the time and it is a spiritual challenge to me to trust the Lord with His babies He's blessed me with. 3. my older kids seeing me having a hard day.sometimes I think I need to be this upbeat Mom all the time and when I'm not it bothers me. 2. loving to be at home with them, do not feel the need to have a "career"
The hardest thing? Having TWO children, I knew it would be hard, but not this hard, it's a full time job protecting her from him. He gets overly excited about playing with her sometimes. And GERMS, very very worried about this winter, especially since I took on being the Cubbies Director at church. i know what you mean about serving. it's not my gift but i still try to be a servant and it's hard with kids. when we went on the mission trip this summer and then milo got sick i had to step back and recognize that taking care of my kids is what i'm called to do right now and also training my older ones to serve. Love her pj's...she is too cute! I feel the same as you! First, I thought actual labor was going to be the hardest thing that I ever went through- it was the easiest! Same with breastfeeding, it's been perfect! I too have well adjusted to being home and finding plenty to do... but, I agree that the hard parts is things like germs, leaving her for a few hours, and even sharing her with family! It's just hard to find time for everyone and trying to please everyone! For now, I am trying to just please myself and her needs and we are golden from there! I could have written those lists myself! The point about Harper being your mission field in this season of your life really touched me. I have an almost 5 month old daughter and I want to view my mission field in the same way... thank you for opening my eyes! I also wanted to email you but I couldn't find it on here, and if you don't get a chance to answer this I totally understand... but I know you had a hard time getting Harper to nap (and I know she usually naps well now) and I was wondering if you had any tips! My daughter barely naps and if she does it's for a half an hour at the MOST and she wakes up tired and miserable. I'm at my wit's end! Any secrets? Or did Harper just eventually start napping on her own? You are such an inspiration to me, Kelly! To me, and to so many! Disciplining is WAY harder than I ever thought it would be. I hate saying no (most of the time!) and truth be told, it can be really cute when they are being defiant. - Being a working mom & feeling guilty every second of every day for it. I love her 100X better with a small bow. Doesn't compete so much with her pretty little face!!! The big bows draw attention away from her sweet face. But she's a beauty too, with a big or no bow too!! Oh, I TOTALLY agree about leaving her. I have such a hard time when I have to leave little missy with someone. It's not even that I don't trust people with her. We are SO blessed to have wonderful people around us to babysit her, and we do take advantage of that!! ; ) But, I just miss her when I'm not with her. So, much harder than I thought!! Oh thank you Kelly for your response! I'm so glad you kept going though after pumping. I hate when I see that people don't even try it. Even though it's not for everyone and it was the hardest thing in the world for me. I felt like I did the best I could and I'm starting to accept that now. And I didn't mean to sound bitter about not being a SAHM. I am so happy and grateful that my job is enough to support us while hubby gets his second degree and can't have a "real" job. I guess that is part of the problem though--the jealousy that comes with me not being able to be a part of play groups, Tuesday morning Bible study, etc. Anyway, I love following your blog and love that you really keep it real with your readers. Post more recipes! Everything I've tried of yours has been excellent! Have you and I ever mentioned we were separated at birth?!?! ha! I love your list....mine is VERY similar. So sorry you are having the blues....very normal and just hang in there like you are doing. And I would say you are DEFINITELY serving not only in the "Harper mission field" but also in the blog world. I always tell myself...there will be TONS of time to have an outside of the home ministry again, but there is only THIS TIME to take care of and minister to my children. God has ordained this time for THIS CHILD. Remember in the story of Hannah when, the year after she had Samuel, everyone went to the temple like they always did and Hannah "did not go." Her husband questioned her on it and she said "I will go when the boy is weaned." She knew this was her designated time with him before she would give him to the Lord and leave him at the temple for good. I think of that so many times when I have to say no to things or choose to stay home rather than be busy serving or doing something. Hannah was doing God's will when she stayed home and so are you!!! Sorry for the long comment....next time I should just call or e-mail you! I have been suprised about many of the same things you have. Here are my lists. Oh Harper - what a love bug you are!!! Breast feeding was SOOO hard. No pain at all, just tried EVERYTHING to get enough milk and never could. Always had to supplement and had to stop altogether at 4 months. Getting out the door - at all, let alone on time. Not wanting to leave her with any sitter (except her daddy). Keeping the house clean has become nearly impossible since she started crawling. Running errands. I always dread it. I love taking her out to go shopping or whatever but when I just have to hop in and out of the car multiple times for errands - it's no fun dragging all of her stuff out and then turning around and putting it all back in (would probably help if I could talk myself into using a sitter!). Sleeping through the night - never had a problem with that. C-section was an absolute breeze. In fact, I never ever had a single contraction throughout my pregnancy. I never even felt a braxton hicks. Never had a single bit of pain. Nor did I ever dilate. Heck, she hadn't even started dropping at 42 weeks! The girl didn't want to come out! I had her at 42 weeks after the Dr. deemed me a "failure to progress" and told me it was now medically necessary to get her out of there (hence the C-section) before the placenta started to die. I was so upset that I had to have a c-section but looking back, it was the best thing ever! I mean, how many people can say that they were holding their baby in their arms and never had a single pain to show for it? I'd do it again in a heartbeat. My recovery wasn't bad either (or I would definitely think twice). Anyway, just wanted people to know that c-sections aren't always the monsters they are made out to be. Flying with her has actually gone really well. We've flown across the country multiple times. I think the key ingredient is buying her her own seat (even though she is only 13 months and we aren't required to) and buckling her into her carseat. Okay, well it's 11:13pm and the dishes are calling! Thanks for the great post! PS - I hope that you are getting to use the shopping cart cover finally! All of your "easier" things are so true! The things that I was dreading/thought would be awful just come so naturally! I think the hardest thing is trying to keep Luke occupied while I fix dinner. He is either trying to get into something not baby-friendly or screaming cause he wants whatever he smells in his belly! I am not a mommy yet so, not really sure "what is hard and what is not"... just yet. I am sure oneday I will be making my list. I just wanted to comment and say, Gosh! Harper has changed so much this month! So cute and is looking so much like her daddy! Y'all are one lucky little family! The part of serving caught my attention. While you may not be serving in the same way, you are still serving. I think too often as wives and moms we look at service as what we do outside the home in our church and our community. But I believe our greatest job in these two roles are to serve our family. Cleaning the toilet is an act of service for your family. Cooking dinner is an act of service. On and on. It took me a while to look at it this way and about a year ago I learned a great little word - "NO" After having my second, I had to learn to say no, I can't do that right now. That doesn't mean I say no to everything, but I have to evaluate how it will affect my family first before I say yes. As my kids get older, I'll be able to serve more and in different ways, but for now, I have to be here for them first. First off, thank you every day for posting about your life,Motherhood and reciepes. I'm nowhere even close to a "good" cook, but I plan to be before I meet my future Hubby =) or at least before he becomes my Husband? Things I thought would be harder, is simply life in general. My life is so much easier (at most times) then I ever dreamed of it being) Due to me being a single Mother at such an early age, I really thought that times would be more difficult and troublesome. But my family and the Lord has never failed me. I'm so thankful for the blessings in my life and my number one Charli! Let me just say that my hard/easy list changed a little with each child. 4th - VERY difficult pregnancy. Had to be induced at 34 weeks. Epidural NEVER worked. VERY painful delivery. And little Ethan ended up in NICU. Came home a mere 6 pounds. With my 4th I thought I knew all I needed. And then he was born early and stayed in NICU. God is CONSTANTLY showing me that He and He alone is in control. The hardest thing is being 1billion miles away in the G-A. Doesn't bode well for things like bringing my friend a vanilla coke on a blue day. :) Love ya girl! First off, you definitely minister through this blog. Much more than you probably even realize. My list is hard because it would be different things with a different baby. With the first, easier than I thought would have to be getting out and doing things. (Not so much now that there's 2 of them...) And now, I would say it's been much easier than I expected to love my second baby as much as the first, which was something I was worried about. Harper is such a cutie! Love love love Harper's pajamma's! They are so cute and I could just eat her up. She is so adorable. You're not near there yet, but the teen years were easier and much more fun than everyone told me they'd be. I loved those teenage years (with a few bumps here and there). And, sending Kale off to college, I thought would absolutely KILL me, but even though it wasn't easy, it was a pleasant experience for us both. We grew closer through it, I think. Oh Kelly, I feel like you just listed out my own thoughts. Except...I think childbirth was WAY worse than I though it would be. Also, I loved you last post about nothing ever being the same. My son is the same way, one day naps like a champ, and I feel like I'm getting the hang of it, next day, all my plans go down the drain, and no naps. Hey Kelly! I was just introduced to your blog and just love it! Thanks for being so real. I am new to this mom thing and at times feel like its just best to be honest and admit that we just don't have it ALL together. The hardest thing for me has been the sleep. My son is almost 7 months old and still does not sleep through the night...but that's ok. I also miss my job of teaching at times and the social interactions that came with that. But I rest in knowing that I am where God wants me to be for this season. I'm in Russellville too...so next time you stop by for fried pies...contact Kristy and I! I can tell you that it keeps getting easier, and better. My little girl, Riley, is going to be one next week (I can't believe how fast it happenend!). There are still some days when you are tired and grumpy, or the baby is tired and grumpy, but more often then not it just gets to be more fun each day. Hang in there...you're doing great!! You are serving in such a tangible way, Kelly! This blog is a constant source of encouragement to so many. I look forward to checking on you each day! You are doing a wonderful job all the way around!! Thanks for your care and concern for others through your prayer blog, requests and updates. You have such a beautiful heart. Easier: having someone be completely reliant on me, changing poopy diapers, being patient, not worrying about how I look because I know there's some spitup somewhere on my outfit that I've missed. What a great post idea. Getting back in shape has been much harder for me this second time around. I'm just too tired to go jump around at the gym. I've been doing pilates the past few nights in my living room - in my pajamas. We'll see if it helps. My new baby, in general, is much easier than I expected. PTL! I really liked this post Kelly! It made me think about my own list and I decided to write about it on my own blog. Oh the joys and struggles of motherhood! Never easy, but totally worth it :) Glad you are enjoying that little Harper as much as I am enjoying my little Ava. We are blessed! Kelly please don't stress over the house not being perfect or dinner on the table. Harper is a baby and babies need lots of attention. Trust me she is going to grow up much faster than you can imagine and you will miss all of this. My children are 24, 28 & 30. I really miss them being little. I miss being able to protect them, tuck them in at night and playing with them. Now I can keep my house spotless and have dinner on the table at 6:00 every night but I would trade all sometimes for the toys all over the floor and oatmeal on the TV! I have to agree with everyone above! You are definatly a role model to anyone who comes across your blog(s)! I love reading and following your adventures with Harper, even the slowest of days have the most upbeat of tunes! Time with my husband. Oh, Lord, time with my husband. I miss him. Anyway, enough gabbing in your comments:) You really are serving all of us with your blog, so thank you! Can I just say, that first picture is the cutest thing I've ever seen! As ever, beautiful pics! And I'll also chime in with the others who say you serve through this blog...you really do, sweetheart. I think everything has been easy. Every once in a while I had those hard moments but they didn't happen very often. My daughter was and still is a very content little person. Wow Kelly! This a a great post. I have only been following your blog for a couple of weeks now, but all the pictures with Harper looking so adorable, and the others you have shared make it appear as if you always have it together, always showered and clean, your house sparkles, etc. I love honest posts from honest moms who are not afraid to admit we are not perfect. We do wear shirts with spit up on them and our babies aren't always happy. Thank you for your honesty. And thank you for your blog. I totally agree about childbirth and breastfeeding being way easier than I thought. I heard so many horror stories (that people are more than willing to share when they find out you're pregnant) about both and thank God, I don't have one to share! Harder than I thought - adjusting to the new relationship with my husband. It changes things, and it is hard to make sure he is still a priority and that our marriage is still a priority and to not let everything revolve around the baby. Also, getting things done around the house....I thought it would be much easier...but I spend too much time just staring at my sweet girl! I always thought the cleaning/cooking thing was the hardest. We were foster parents to over 100 kids, normally having 10 at one time. My Spiritual gift is probably administration so I am well organized. The kids were always at church on time and we were on a fairly strict schedule. This is funny because my daughter with the triplets is still pretty much on the schedule she had as a child at home. I was more a germophobe with those guys than she was. She was not afraid to take them anywhere and could carry three carseats at once. Her house suffered the most for a while, but that is now under control. You are just beginning! It is fun to see your kids grow and have the same qualities, practices that you do. My best advice - encourage Harper to find God's will for her life and accomplish that. Even if it takes her to a mission field. I would rather have my kids serving God in China (Which one will be returning to) than serving themselves or Satan here in the USA. I think that about sums it up! I couldn't agree more! What a great list Kelly! I don't think I could have thought of all of them. You are so good. I never expected it to be so hard when my children aren't with me. The constant thought of them, the worry...it's terrible for me. My mother says that feeling never goes away either and I so understand her now. Kelly, I can totally agree with you on the fear of having #2 after #1 was 10 pounds. My son was 10 pounds even, and I was scared to death about the 2nd being big too. I even convinced the doctors to induce me a week early because I did not want another huge baby. She was born at 39 weeks and was a normal 7lbs 3oz. The labor, delivery and even the pregnancy was easier with her. I really think some of that was that I was way more relaxed with the second one. Hi Kelly, I am glad you posted this. I am 23 weeks pregnant with a little girl and the items that you listed as easier than you thought are exactly what I am thinking will be hard. It's nice to hear what other mom's are thinking and going through. I would love it if you posted about what baby products you found to be necessary/unnecessary. I am in the middle of creating my baby registry right now and there are just so many products out there! It's so overwhelming. I would love to know what product worked for you and what didn't. Looking forward to the wedding shower post, TGIF! You hit the nail on the head! I totally agree with you about the things that are hard and easy and how they are different than I expected. Some days are tough! Get the book Rattled by Trish Berg - it's biblical and funny and true and so much more! My husband and I couldn't do anything but laugh at ourselves when our girls were young. We couldn't go anywhere without discovering spit up on us somewhere. We smelled like cheese for several years! But like you said, you just get used to it and stop worrying about it. I'm only 6 weeks into motherhood but so far I agree with your list with one addition - blogging on a regular basis has been harder for me than I expected! I thought I'd be able to blog all of the time - I can read blogs still but having free hands to type is another story! My boys are 4 and 7 now so the thing that I find the hardest is learning to separate their hurts from mine. First day of school jitters, other children being mean, etc. There are a million things that happen that force me to take a step back and remind myself that adversity leads to great character. That is absolutely the hardest part for me as a parent. This was a great post, because I am newly pregnant so it was interesting to read about life after the baby comes. It scares me so much! I feel better now. Everything will work itself out I believe. to go to church and attend mass as a "devotional time"
to accept that there's no such thing like the "perfect mom"
Harper is so cute. Her eyes are beautiful!!! God Bless. What a great honest list!! It gets us that aren't mothers a little insight into how it might be. I really love how you said it was easier than you thought to get the baby weight off! So there's hope yay!! I think that might scare me more than anything! This is a great post! I'm 35 weeks pregnant with our first child (little girl! ), and everything you said was easier than you thought is something I have been freaking out about. Very encouraging! I think someone else said this, but I'd love to hear your baby "must-haves" and "can-waits" (or just "don't needs")....my husband and I are going to complete our registry tomorrow, and I honestly have no idea what I will need right away. I love your blog.....one of my favorite reads! Oh, she's adorable in those jammies! I'm glad to hear you don't mind getting up at night with Harper. My friends always acted like I should push my babies to sleep through the night sooner. My second didn't sleep through the night routinely until 10-11 months, but I didn't mind. It was my special time with her. Cherish it b/c it will go by so quickly. The hardest thing for me is how fast my little is growing. She is already 2yrs and 3months and it blows me away! The easiest thing for me was going from a fulltime job to staying at home...love it! I agree with a previous poster, you are serving soooooo many people through your blog, thanks!!! I love love love being a mommy, but you are right - some things just aren't as I imagined! I had visions of a clean organized June Cleaver/Martha Stewart type house, but had to come to grips with the fact that will never happen! There is always laundry to be done, a tub to be scrubbed, meat to be thawed, a baby to feed..... And the toys! Our den looks like a modern day land mine :) BUT in spite of it all I am as happy as happy can be! I have learned to quit stressing about all of the other stuff and just enjoy every moment with my sweet baby boy! I loved this post! I agree with most of your items, except losing the baby weight...I think I am still gaining one year later and breastfeeding did not help me lose a single pound! Share your secrets, pretty please! I don't have kids yet, and frankly, everything about it sounds hard! I was relieved to read your "things that have been easier than I imagined." For the record, I really admire all of you moms because I know that it takes so much work and love! When my expecting friends have asked I always tell them it is what you have in your mind, but MORE...good and bad. More fun, more worrisome, more tiring, more love, more expensive(ha ha), more messy, more cuddly, etc. I loved hearing the video of Harper laughing!! Precious sounds. Thank you for sharing your lists. It gave me some things to think on. Kelly, the more I read your blog - the more I fall in love with you! I don't even know you IRL but I get this feeling we would be fast friends. That is your gift also. The gift of being real and relatable (is this a word?!?) to other. You are so right in what you said about Harper being your mission field and your place of service right now. Being the wife of an unsaved man, I always remember that my home is even a mission field. You are blessed and you continually pass these blessings on to your readers. Thank you! Kelly you are too funny! This is 2009, not 1950! You look more beautiful with spit up on you, bags under you eyes, and a dirty house! HA! Well, I know it's hard to let things go that before used to be your priority, but as you know, Harper is a little person that depends on you for everything! You're doing an amazing job with her alreaady and I know you will teach her the ways of the Lord. You are serving by being the best mom you can be right now and being a loving wife. The time will come that you will be able to do "more" but right now, you are doing amazing. It is very hard to become a mother, very rewarding, but difficult in many different ways. One day you will wake up and think, "Oh wow today was an absolute breeze. What was ever hard about this?" Then along comes #2! HAHAHAH!! Kelly, I'm a "server" too, and it was really hard for me to put some of those things I loved to do for others on hold for a while. But, my son just turned 2, and all of a sudden I feel like I have lots of free time again! I'm still staying home with him and he's not in preschool yet, so I'm not sure what the change has been. I think it helps that he takes one long nap in the afternoon rather than lots of short ones like younger babies do. Also, he can go along with me to do some things now. I am able to do things like offer to watch friend's kids or make meals for people that seemed overwhelming when he was younger. Anyways, I just wanted to encourage you that your ability to serve people in your church and community may come back sooner than you think :). And what a blessing for Harper to grow up serving along side you! Probably the hardest thing for me is to not interfere when daddy does things his way. 'Cause, you know, if it's not done "my way", then it's not right! Also, I never thought I'd be this lonely. Spending so many years as a stay at home mom, while your friends have either not started their family, or stopped after 2 kids, while years later, I am still changing diapers. i agree, having the first is way easier and way harder in many different respects. i like what the mom above said about how it's just like you imagine except more of everything. now, i will tell you that when you add children, somethings that were once easy turn difficult. with my fourth, it is almost impossible to get out the door and have a somewhat clean house to come home to. managing four out in a store or restaurant is pretty much impossible (at least with the ages of kids i have)for an extened perios of time (i'm talking 20 mins). i remember with #1 how great it was to pack the diaper bag, dress us both and hit any store/restaurant/lunch date/car trip with ease. with the second it's a bit harder and so it goes with every child you add. mops is my release b/c i can make it there on time an talk to other moms who feel just as crazy as i do. i was glad to see that you are joining a mops group. if you ever want to know the craziness of many young children, feel free to check out our lives on my blog. enjoy this time with your sweet girl! THis is a great idea for a post, I love reflecting, hope you don't mind if I steal your idea and do my own. I love this one. Motherhood in general has been easy but I don't get to do all the things that other mommy's get to do! My son is "special" and his needs are different!! But I understand the nicu stay! We were there for 5 months!! aww she's getting so big and still as precious as ever! I, too, have a list of things NO ONE told me about being pregnant and things that have been different than I expected since having a baby. I will have to post it too (actually, I have been meaning to for a while, but Cilla is not a huge fan of my time on the computer!) I laughed reading you list of "harder" things because I can totally relate to several of them. So, know that you are not alone! love this post and all your thoughts. it is so surprising what is easier and what is harder. you and that sweet girl are obviously loving each day together! You put the exact words in my mouth on every single one of these on both lists! Funny! And ps, you are serving through your blog WAY more than you even imagine! This is so fascinating to me! I really think that I must have NOT had many preconceived ideas...or else I've forgotten them all four years later. LOL. But one thing I know for sure is that the little things can be hard and the hard things can be a breeze. It just all depends on whether or not we are accepting that much needed Grace from the Father. My little boy is a little older than Harper and I second just about everything you said. Breastfeeding was hard for me-I wasn't very good at it for some reason. And I'm still amazed at how easy the childbirth was. Thank the Good Lord above for epidurals. I am expecting #2 in March so we'll see how I manage with two children haha. I hope it goes as great as it has with 1. Taking care of her- I was so scared that I would make some dumb mistake and hurt her in some way. Breastfeeding- this came pretty easy for us, she latched on right away and haven't had any big problems. Scheduling- she fell into this pretty easily without having to cry it out or anything like that. Worrying- I am constantly worrying about her. In every way you can think of. Constant Mommying- never getting a break is hard sometimes! And she won't take a bottle so my "breaks" are like 2 hours between feedings. Childbirth- 43 hours and a ridiculous recovery. I'm still not "normal..." baby #2 will have to wait for a while! Naps- Yes she sleeps all night but her naps, well I'm lucky if I get 45 min's at a time. Housework- thought I'd be able to keep up my card system and keep everything nice...but by the time I eat breakfast, work out, and shower, it's past lunchtime! I feel like I'm always playing catch-up and it can be so overwhelming! I remember it was easier to get up in the middle of the night than I excpected. I would even lie there sometimes waiting for my little guys to wake up. I love the inspiration I get from your blog. Thanks! Breastfeeding was both harder and easier than I anticipated. But I was an extended nurser (past one year) and I NEVER in a hundred years thought that would be me, so we obvs. got thru the hard part. The first 2 weeks home with #1 was so much more difficult than I anticipated. Why I thought a major life change would be easy I dunno, but man - that was hard! Number 2 was waayyy easier even though there were 2! Same thing with the recovery after #2. Once your body has done it once, it's much easier to do it again. I know that seems illogical, but it really is a lot easier, physically and mentally. At least for me it was. Serving - I totally hear you! But here's what I learned...God called me to motherhood that's a huge area of service. I was a worship leader, a worship planner, involved in lots of things and then there was a time when nothing was available to me. It was devastating to me. We ended up attending a church closer to our home instead my childhood church (only for convenience sake) when the girls were 2 1/2 and 6 months old. Within 6 months I was right back into it again and with a 5 and 3 year old I'm doing all sorts of things now. Measured of course, still with motherhood as my main priority. But God will call you back when He knows you're ready for what He has in store for you. And I would bet the Compassion trip this fall is just the beginning. And don't think that this blog isn't service too! I also discovered that He called me into new areas than I'd ever served in before. Motherhood gave me new perspectives that helped me serve differently and better! I agree with all the previous posts. You most certainly do serve through this blog! I am a brand new mom to a 7-week old baby boy and I've already been thinking about things that are easier and harder than I thought they would be. -Taking care of my baby by myself. My husband is deployed so I'm solely responsible for providing care for my baby. -Recovering from a c-section- my son turned breech at 39 weeks and I had to have a c-section. I was devastated at first but it turned out way better than I expected and my recovery wasn't bad- I didn't even need any pain meds except for ibuprofen. -Sleep. I thought I could never go without a solid night of sleep but it has been WAY EASIER than I expected. -General baby care- diaper changing, bathing, etc. -Getting anywhere at all, much less on time. -Looking halfway decent- I totally laughed when you said that you are always sweaty and a hot mess... that's EXACTLY how I feel! -Leaving my baby. I feel the same way! Every time I am away from him, even for an hour, I have this sense of urgency to get back to him right away! I love reading your blog. You are such an encouragement to me as a new mom! Okay, I must share with you after reading your lists. My first son was 9 lbs 3 ozs. He was also posterior...sunny side up as they say. I tore to the fourth degree during his delivery. I had never even heard of a fourth degree tear before I had one. I'd only heard of women tearing to the third degree. He was so stuck they had to use the vacuum and forceps to get him out. My recovery was horrendous! I had pain in that area for, literally, years. I was terrified the same thing would happen when I had my second baby. Thank goodness I was wrong! My second son was "only" 8 lbs 13 ozs. My doctor induced him two weeks early due to the size of my first. He was not posterior like his brother, and I didn't tear! My recovery from his delivery was SOOOO EASY compared to the first! Oh goodness, it was such a relief. Please don't worry yourself silly over the next delivery. Now that your doctor knows how well your babies grow, he/she will keep a close watch on the next baby's size and deliver before they're quite so big. As for the NICU fears, I totally understand. My second son was in the NICU for two weeks. That fear is one that will always stay with me. A lot of my motherhood experiences hard & easy mirror yours-and to tell the truth it doesn't get any easier with 2 KIDS. I thought after I had my 2nd daughter that things would just come easier to me and I would stress less about all things' my kids' but they did not; I actually think that I've became more stressed about everything involving them and I defiantly put more thought into every choice or decision we make as a family. But, over all I believe that it all balances out. It is what it is having children involves so much and it's just whats expected I've learned that now with my second baby I get stressed and worried but I look at my kids and all that stress and worrying just doesn't seem that cruciel anymore. I give being their mom 200%(percent) and the days that I'm feeling blue it's just a day of feeling blue. As mothers we have alot on our plate and so it's okay to have days when you just want to be mellow and vent to someone or to yourself. Things that I thought were easier - basically EVERYTHING with baby #1 (childbirth, breast feeding, waking at night, etc. and actually even keeping the house and laundry taken care of was easier than I thought it would be). I was surprised how in control everything seemed. And now I'm having baby #3 ha ha ha ha ha ha ha!! My 1st child was also a 10 lb baby (w/ a huge head!) so I totally get the 3+ month recovery! If it any reassurance, after a 10 lb baby, the 2nd one is much easier! Best wishes to you and your adorable family! Kelly - I went through my son's life a single mom. You know hard being a mom is - all I can say is that you just do it and do it the best way you know how. I am now the mom to an amazing 23 year old young man who is everything someone would want their son to be. It all turns out in the end. I read your blog just to see Harper's photo's. She is so beautiful and makes me smile every time your page opens. You live a life of faith - you are serving your own family right now. The others can wait a little bit longer. Kelly, this is too funny! I am not going to lie, I am terrified of the idea of childbirth! I am glad to read that it isn't as bad as I think it will be! I hope you and Harper are doing well! I love seeing how much she is growing and changing these days! It is just amazing how much she is growing! Those pictures of Harper are way too cute. I love the look onher face. The way that I describe motherhood, the best and hardest thing I have ever done. There are so many things that I love about it and so many things that test me on a daily basis. But I wouldn't give it up for anything!! Our baby boy is 2 months old today and so far I don't think the lack of sleep is that bad. My husband would tell you otherwise. I DO think taking him places is hard. Just the packing everything up, making sure we have bottles/diapers and hoping he doesn't throw a fit! But you are right...leaving him is hard even for just a little while. Kelly--I love your blog! My co-worker Vicki (from South Texas Children's Home Ministries)was at the conference in Arkansas this weekend and shared your blog with me shortly after returning. I've been stuck on it all day! I am 16 weeks pregnant with my first so I REALLY enjoy the mommy stuff. I've passed your blog and some of the links from your blog (Veronica's hat site, etc.) on to a friend of mine who is 22 weeks pregnant. I am very excited to follow your blog and be encouraged! Thanks in advance for the way you serve through your blog! so funny Kelly, Now that I have my kids, I think I am opposite of you. Never could keep my house clean before kids. Now everything has a place, and is in place. It forced me to get organized. Making dinner, I was just always so lazy before kids, it was so easy to say, oh, I dont feel like cooking tonight, lets go out. Now, dinner is on the table by 530! As for serving, I just would always find an excuse on why I couldn't. I would work in the nursery 1x a week before kids, as I just longed to hold a baby, now I skip out on the nursery (I have 4 kids now, longing is over!!!) but we have started hosting a bible study in our house, I started a MOPS group and am co-cordinator there), I host a table at my womens bible study, I am on the team for brining meals to housebound/surgery/new mommies so I am constantly bringing meals to people. Before kids, I just couldn't get organized enough to ever schedule things, now that I have 4 I feel like the hard things for other people are getting easier for me!!! The Germs thing is tuff, but the past 6 months I figured well, its either they get sick now, or in 1st grade. Better to be sick now then having to miss school later (I also an icu mommy). Play dates now....I live for them!! Not for my kids so much, but for my sanity. Its time for us moms to bond, get advice, tips, and realize that I am not in this alone!! Just thought I would share!! Well what was different for us is that we had twins! lol Juuuuuuuuust a little different. And it was and still is very hard sometimes. We love 'em though so much.